Sure, there’s always a time and a place for cute, or romantic, or rustic, but I hold a special place in my heart for modern. There is just something about clean lines, bold elements, and in your face design, that speaks to me, and it also happens to be exactly what I’m bringing you guys today! 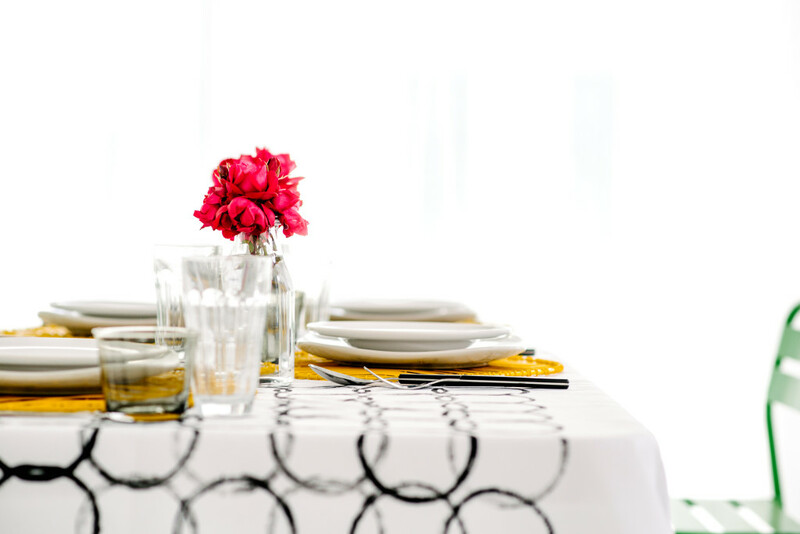 And a table linen really is the starting point for your table design. It can make or break a good tablescape and something that I’m not always willing to go broke over either. So what do I do instead….? 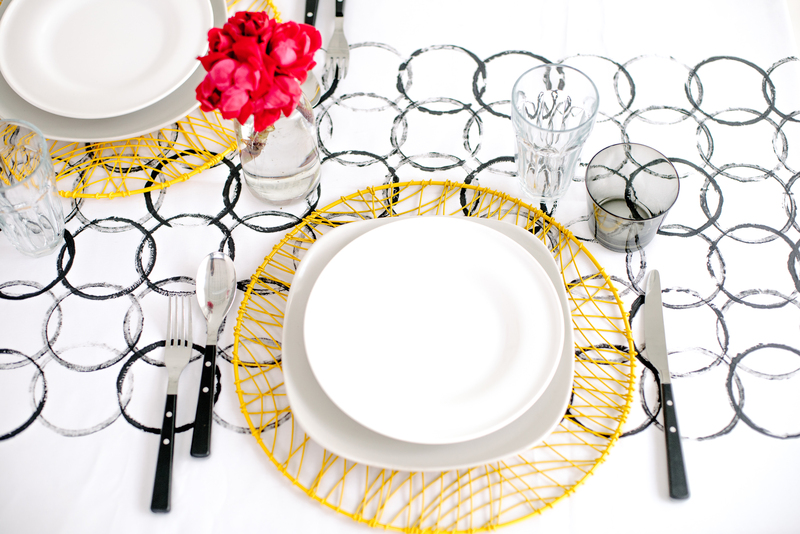 This DIY graphic print tablecloth combines my love for graphic elements and the awesome feeling of saving a lot of moolah on a fancy looking table linen! First, decide on the width you want for your graphic “runner”. Tape off the area to help you maintain a straight line. (If you choose to eyeball it and do find that you’ve started to go a little crooked, you can fix it fairly easily by spacing out each circle a bit farther apart or pushing them closer together when overlapping them). Dip the rim of your bowl into the fabric paint. Don’t focus too much on the amount of paint. The variations of the paint thickness are what give the pattern some definition and texture to the overall design. 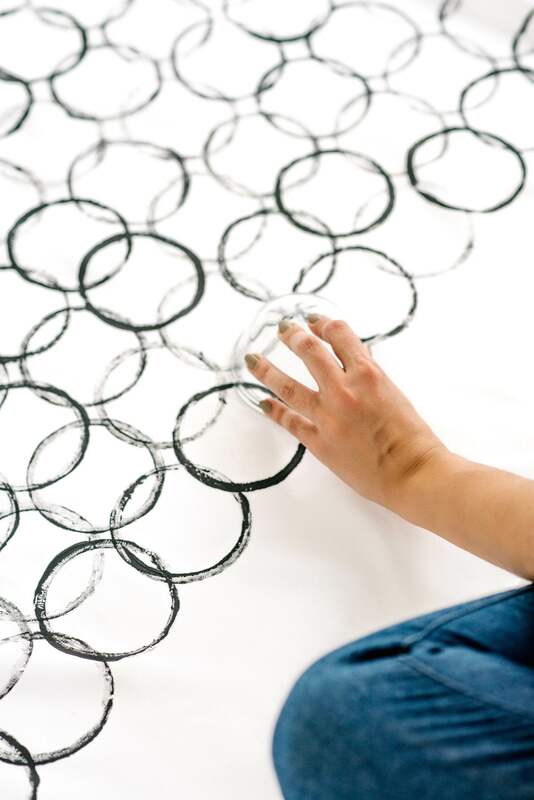 Starting from one side of your taped edge, and working towards the other, “stamp” overlapping circles onto your tablecloth. You can space them as close or as far apart as you want, but you do want them overlapping at some point. 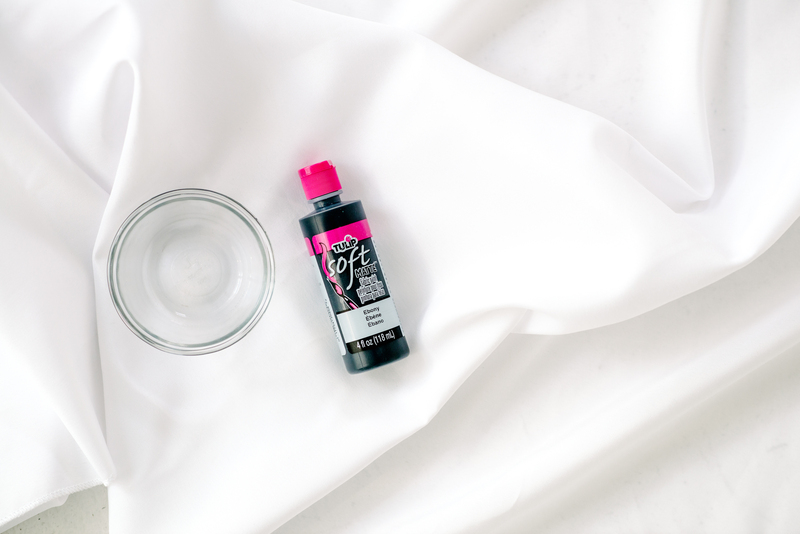 “Stamp” a couple of circles each time you dip the bowl into the paint to create the different shades of black on the tablecloth. The pattern will resemble a “coffee cup stain” type of look with the different variations of paint density with each circle. Maybe I should have dubbed this project my coffee cup stain tablecloth….no? 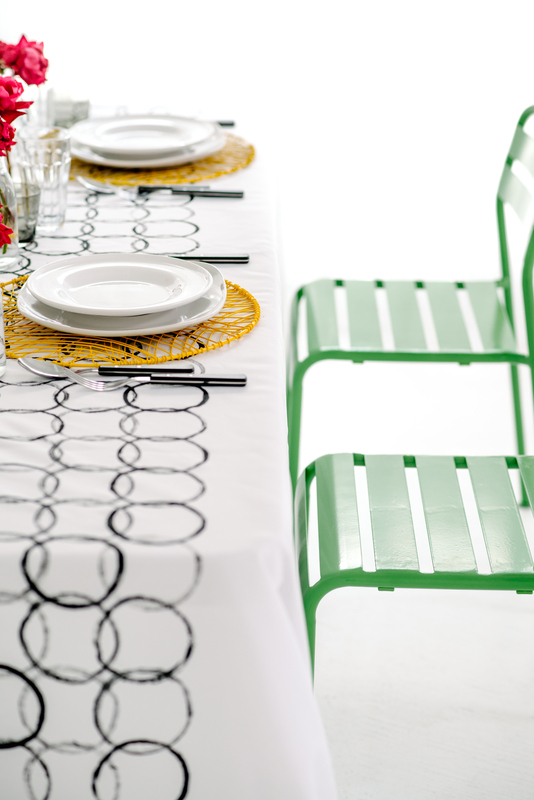 Continue moving from side to side on your tablecloth until the entire middle section of your cloth is painted, creating a faux “runner” down the center. 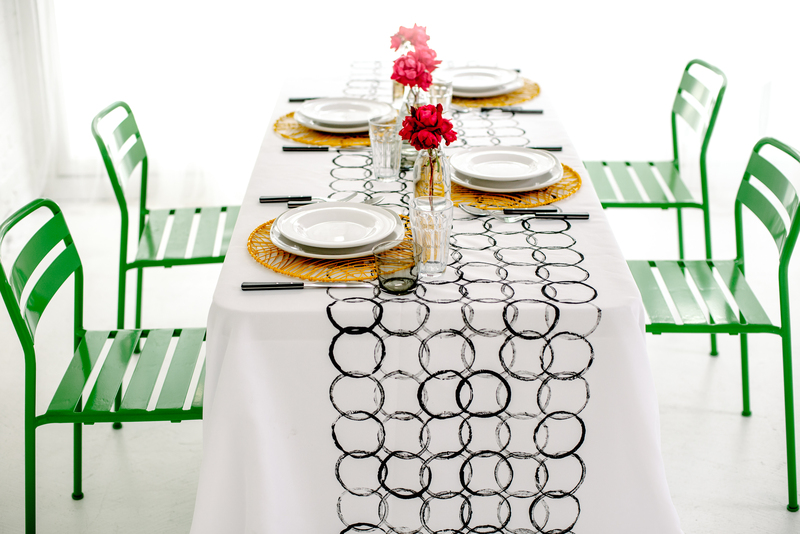 I absolutely love the pop this DIY graphic print tablecloth creates just from the pattern alone. 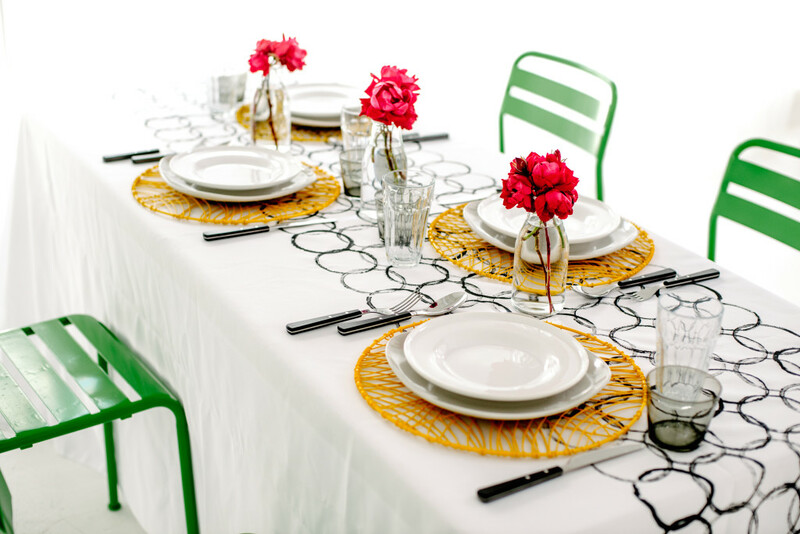 You can add in other bright pops of color to make your table more playful or pair it with soft pastels to dress it down a bit. Either way, this table is going to get some attention! the table cloth is lovely! Where did you get the chairs??? What a great table cloth! Thank you for sharing. It is perfect with the green chairs. Do you know where the chairs are from? Thanks Shannon! The chairs are from Ikea! Wow! This looks really awesome! Great DIY! Hi! This is such a great idea. If I want to stick to my kitchen’s theme of brighter colors, how do you think it would look with some randomly added light yellow or green circles?? Not sure they would have a bold enough impact to go with the black…. Thanks! Hi Annie! I definitely think the yellow would be too light paired with the black, but green could be really fun! I’d recommend something close to a kelley green!